Blablabla Tasarte i Gran Canaria, Spania: Bestill nå! 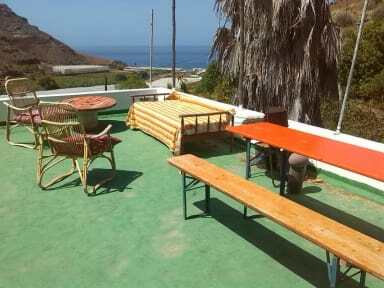 The sun shines every day in this beautiful place nestled in the barranco (valley) of Tasarte. Tasarte is a magical serene place, like stepping back in time, far from the hustle and bustle of Las Palmas and Playa de Ingles. The road down to the hostel has recently been resurfaced and is therefore ideal for cyclists and motorcyclists. 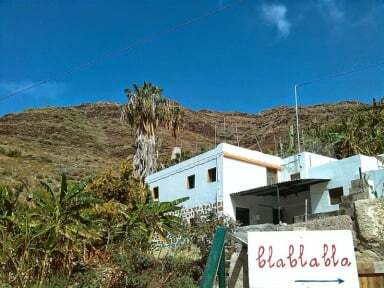 The Blablabla Hostel is a traditional rustic country house offering charming, spacious and clean single and double bedrooms and dorms with bunk beds. There are spectacular views from every angle of the stunning landscape, mountains and the ocean especially from the enormous roof terrace. The stars at night are an astonishing delight. The beach is a ten minute walk, with a restaurant serving traditional locally sourced delicacies during the day and a local bar is situated two minutes away which also serves Canarian dishes until late. Tasarte is a perfect base for hikers and climbers as we are surrounded by dramatic mountains, coastline and trekking paths. Hiking in the mountains, cycling along breathtaking roads, swimming and kayaking in clear blue sea or simply relaxing in this peaceful idyllic area and enjoying regional food are just some of your options. We offer you a house you will never find by yourself, you will feel at home immediately with friendly, helpful staff, double rooms, fully equipped kitchens, large living spaces inside and out and a huge roof terrace in Barranco del Tasarte in the south west of Gran Canaria. Twice a day a Bus (gua-gua, read ua'-ua) from Puerto de Morgan will drop you very close to the hostel. With your own car it is a perfect starting point to explore the Island. I nice place to chill out. Completely quiet. Very helpful and friendly hosts. Green environment, two large terrasses with plenty of space to sit and socialise. A lot of cats and also a few dogs, all friendly and calm. We werethe only guests this night (July month), but there are meny rooms, beds, and we could enjoy a completely new bath room. This happened to be the night of Fiesta de Carmen, and we could hear the music from the neighbourhood. Nature in this barranco is fantastic! Recommended!